Trails on either side of the highway lead visitors through the mighty stands of this coastal forest. On the south side you will find the largest Douglas firs – one measuring more than 9 metres in circumference. On the northern side of the road you’ll find groves of ancient Western red cedar standing sentry over nearby Cameron Lake. The park has been restoring some of its trails after a severe windstorm on New Year’s Day in 1997, which changed the look of the park forever. The storm toppled hundreds of huge trees and obliterated sections of the trail system. Some sections of the trail system were so badly hit that they have never been reopened. Restoration and cleanup began almost as soon as the winds stopped, and although visitors will now find many of these huge trees lying on the ground, their value has not diminished. These fallen trees open the canopy to provide light, space, shelter and nutrients for the next generations of plants. Natural regeneration is beginning to restore the Grove’s pristine beauty and the park’s diversity, making a visit to Cathedral Grove all the more intriguing. Improvements to MacMillan Park can be supported by “feeding” the donation tree next to the main trail; your contributions will be used for youth team trail projects, volunteer projects, revegetation projects and new signs. The park’s small size and accessibility has left it vulnerable to impacts from high visitor use. Please stay on designated trails, where you will find ample opportunities to view and photograph this bit of history. Special Features: The park protects and preserves an internationally significant representative example of Douglas fir old-growth forest within the Coastal Western Hemlock Biogeoclimatic Zone. Cathedral Grove in MacMillan Park is an old forest. Its large trees will continue to live for many more years, but root system disease will cause some trees and branches to die. They can fall without warning. Please stay off the trails on windy days. Please use caution when driving, parking and walking along or crossing the highway within the park. Cathedral Grove in MacMillan Park is an old forest. Its large trees will continue to live for many more years but root system disease will cause some trees and branches to die. They will fall without warning. Please use caution at all times when in the park and stay off the trails on windy days. Smoking is prohibited in MacMillan Park. Due to concerns about public safety associated with very high levels of use in the park and along the adjacent highway, BC Parks does not allow commercial filming within MacMillan Park from May 15 through September 15. Smoking is prohibited in the park. The park’s small size and accessibility has left it vulnerable to impacts from high visitor use. Please stay on designated trails, where you will find ample opportunities to view and photograph this bit of history. MacMillan Park (Cathedral Grove) is located on central Vancouver Island, 25 km west of Qualicum Beach and 16 km east of Port Alberni on Hwy #4, which runs right through the park. From Hwy #19 and Hwy #19a take the exit to head west on Hwy #4 toward Port Alberni. Nearby communities include: Port Alberni, Coombs, Qualicum, Parksville. History: The name “Cathedral Grove” appeared in correspondence to the provincial government in the 1920s. This colourful description of the stately trees is reputed to have originated from the Governor General Viscount Willingdon in April 1928. Cathedral Grove was a well-known tourist stop on the Alberni Road in the 1920s and 1930s when the timber was owned by the Victoria Lumbering and Manufacturing Company. For 15 years the public encouraged the provincial government to acquire the lands within Block 35, Cameron Lake area. The citizens’ organizations, The Associated Boards of Trade of Vancouver Island, petitioned the government in 1929 to preserve forever, for the public benefit, the well-known stand of timber at Cameron Lake, known as Cathedral Grove. In 1944 H.R. MacMillan, a well-known forester donated the 136 hectares of land for the perpetual enjoyment of the public in recognition of the unique stand of trees. Three years later, the area was established as a Class A provincial park. Conservation: The park protects and preserves an internationally significant representative example of Douglas fir old-growth forest within the East Vancouver Island and the Coastal Douglas fir Biogeoclimatic Zone. Wildlife: Many species of wildlife use the old-growth forest as their home including several types of woodpeckers, owls, insects, reptiles, amphibians, deer, elk, black bear and cougar. The Cameron River, which flows through the park, contains rainbow, brown and cutthroat trout. Cycling is permitted on roadways only, not on park trails. Bicycle helmets are mandatory in British Columbia. Trails on either side of Hwy #4 lead visitors through the mighty stands of this old-growth coastal forest. On the south side you will find the largest Douglas firs – one measuring more than 9 metres in circumference. On the northern side of the road you will find groves of ancient Western red cedar. Trails are well marked and maintained; some are wheelchair accessible. Loop trails lead through the old-growth forest and a raised viewing platform on the south side of the park offers a unique perspective of the surroundings. The park’s small size and accessibility has left it vulnerable to impacts from high visitor use. Please obey posted signs and stay on designated trails, where you will find ample opportunities to view and photograph this bit of history. Pets/domestic animals must be on a leash and under control at all times. You are responsible for their behaviour and must dispose of their excrement. Garbage cans are located at the parking lot. Backcountry areas are not suitable for dogs or other pets due to wildlife issues and the potential for problems with bears. This easily accessible park offers awe-inspiring views of old-growth ecosystems throughout. 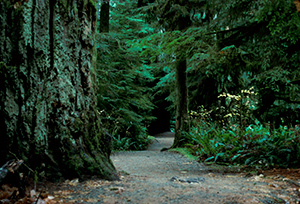 On the south side of the park you will find the largest Douglas firs – one measuring more than 9 metres in circumference. Two pit toilets are located on either side of Hwy #4, next to the parking lot. Pit toilets and some trails are wheelchair accessible.